a couple of weeks ago, jared was out of town for a few days and i was left flying solo...no big deal as keeping myself occupied has never been something i struggle with. i really value my time at home and have been busy cooking, knitting, working on that neverending quilt, and taking some nice long walks with freddie. because jared is vegan, most of the meals we eat at home are also vegan. i do eat eggs and dairy and will add cheese to my burrito, or have eggs for breakfast, but mostly we eat the same thing. i really don't mind this and over the past almost eight years i've gotten so used to cooking and baking vegan that i find myself confused on the rare occasions when i venture to make something that's not. since i've been pregnant, though, i've been eating a lot of eggs. both because i've been craving them more and for the necessary protein boost. so when i found out jared would be gone this week, i immediately decided i would make a quiche in his absence. i even went all out and made myself a crust from scratch! 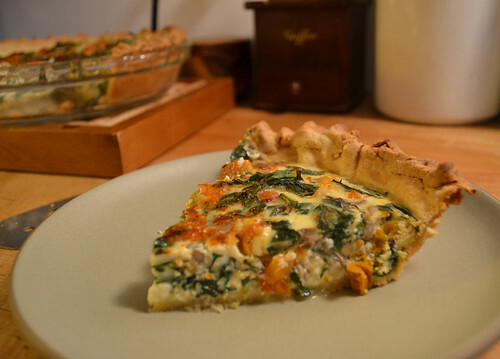 in college, quiche quickly became my go-to meal to cook. i'd buy the frozen crusts at the grocery store and throw in a pile of shredded cabot seriously sharp cheddar and whatever veggies we had lying around. 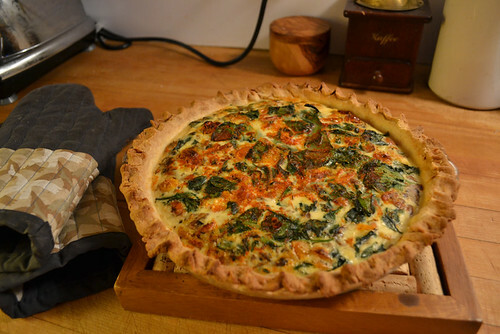 the original recipe i followed was for the mushroom swiss quiche in the moosewood cookbook (one of the very first cookbooks i owned and used myself) but i never used swiss. i think i brought quiche to every single potluck i attended in college and shortly thereafter (charlotte's mom reveled in this development). fast forward to me marrying a vegan and i don't think i've made a quiche in eight years. not that i have never had the opportunity in that time, it just hasn't occurred to me like it did this week. but it did. and it was delicious. like i said, i mostly just wing the recipe and i didn't write down any exact measurements. like i do, you can use whatever veggies you have around, this recipe was based on what was taking up space in my fridge this week. i was also super happy that i thought of all the 1/2 pint jars of roasted herbed cherry tomatoes that i put in the freezer last summer. they were a delicious addition! preheat oven to 350. saute the garlic, spinach, and mushrooms in a pan with the olive oil. add salt and pepper (and any other spices you like, thyme is good here) to taste. while the veggies are cooking, whisk together the eggs, milk, and flour. spread the shredded cheese to cover the bottom of the pie crust. depending on how cheesy you want your quiche, you can really pile it in here, or just spread a thin layer. spread sauteed veggies on top of the cheese. pour the egg/milk mixture on top of the veggies. it will fill in all the empty space. sprinkle some more paprika and kosher salt on top and bake for about 40-45 minutes.let it cool for about 15 minutes (or longer- this can be served at room temperature or cold if you like). enjoy! I used to love quiche as a kid. My parents made it often enough that I remember it pretty well, but I have never made one myself! I was also vegan for years, so it must have gotten lost in time somewhere. I am going to try this. I have the Moosewood, so will check it out there too. Thanks! PS I thought you may be pregnant, from a few hints on IG, but wasn't sure to ask. Congratulations Julia!